It is graduation day. I’m keenly aware of the preparations and ceremony associated with “our” high school’s commencement ceremony because I live a block away. Each year the high school stadium is transformed into a place of honor for the graduating seniors. As is the tradition of the public high school, all of the male graduates dress in black suits with white shirts and red ties. The young women dress in white dresses or pantsuits and carry bouquets of red roses. The school has used this tradition of dress since the early 1900’s and the pageantry is breathtaking. This time yesterday my plan was to be away from home during graduation. I wasn’t sure that I wanted to hear the sounds of the school administrators announcing the names of the over 300 graduates with the requisite cheers from the crowd. I didn’t know how I would handle the strains of “Pomp and Circumstances” drifting from the stadium and settling in the air around my home. It felt too soon to absorb graduation season knowing that what seems like no time at all but in reality was 3 years ago, my family and I were the excited and proud people walking to the stadium to claim our seats and watch my son Jordan transform from high school Senior into incoming college Freshman. Jordan’s high school graduation was a further marker of his success and I couldn’t wait to celebrate him. Now it is hard sometimes to separate the anticipation and pride I felt in all of his accomplishments and goals from the cruel way we lost him. I struggle trying to reframe momentous occasions so that they will be less difficult to bear. I don’t want to live always feeling uneasy with celebrations and joyous affairs. I have friends who have children graduating high school this year. I need them to know even in my absence from their celebrations that I stand proud of their children as they do of mine. Mark and I weren’t ready to attend the parties in their children’s honor even though in each instance we were so grateful and honored to be invited. 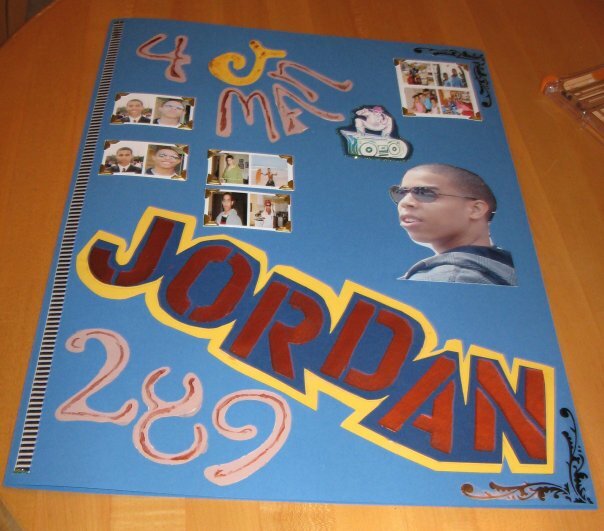 It has been 1 ½ years since Jordan died and three years since Jordan’s graduation and it’s still too painfully soon to be in fellowship with friends on occasions that used to give us only joy. I struggled so much in deciding whether or not to attend my friends’ parties. In deciding, grief overwhelmed me as I thought back to Jordan’s graduation party and the anticipation we held for his future. I didn’t want my sadness to in any way be a damper on the festivities. I also wrestled with feeling self-conscious about attending a graduation party and being a reminder to others of how the happy lives we all want for our children can go so tragically wrong. I was so angry with death for stealing the joy and excitement I once carried. I wondered as I pondered each invitation, “Will it ever feel okay to truly celebrate?” To each invitation I replied with a “maybe” knowing that even if we decided at the last minute to attend we would be welcome. For Mark and me even at the last minute our hearts were heavy and we knew that dropping off cards of congratulations to the graduates was all we could handle. Upon awakening this morning my mood and sentiment about being in the vicinity of the graduation ceremony had shifted. Before I got out of bed, I took time to remember how happy I’d been the day of Jordan’s graduation. I closed my eyes and held still. I remembered finding him amongst the graduates as they filed in to take their seats at the ceremony. “There he is, there he is,” I yelled. I cheered so loudly when his name was called, “Yea Jordan, way to go.” As I lay there, I could hear his voice in my ear saying “thank you” as we all gathered around to congratulate him. It was a lifetime ago and 3 years ago all at the same time. How is that possible? I held these images and sounds in my heart and decided they would be my guides for the day. The memories I have of my son serve so many functions. Today the memories of Jordan’s graduation will be buoys lifting me beyond my sadness to a place of gratitude and pride. I got out of bed knowing that I wouldn’t need to escape the sights and sounds of graduation. They would be welcome in my day. While out walking the dog today, I thought about the graduation that would happen in a few hours. 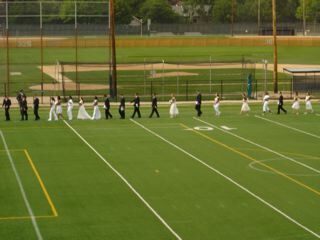 I decided to walk to the corner that overlooks the field and stadium where graduation is held. I stood for a moment watching the workmen ready the grounds. 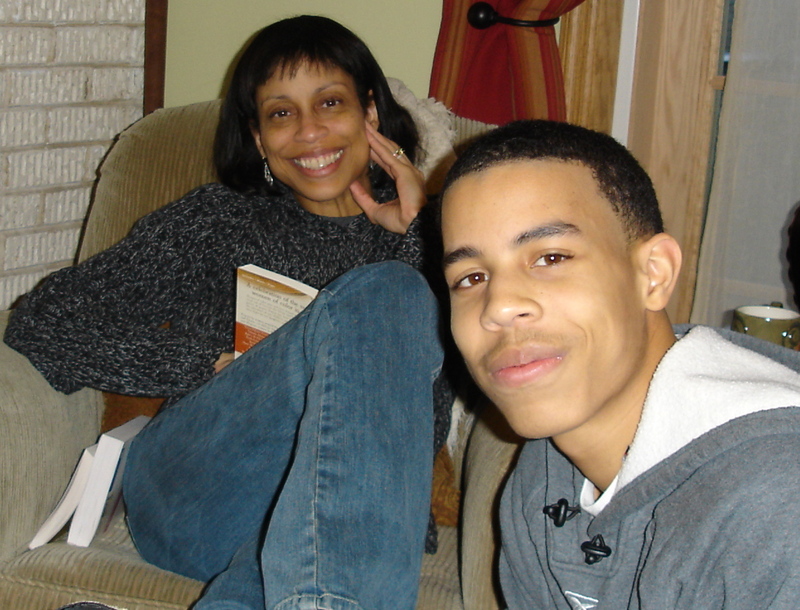 I felt the shift in me as I thought of my youngest son who will be a high school graduate this time next year. There are days when I wonder if I can bear to have another of my children going off to college. I have to prepare my heart to once again be the excited and proud parent in the stands. Even in my sorrow despair never stays too long. This time next year I hope to sit in the stands and point out my son, “There he is, there he is.” And when they call his name I’ll cheer loudly once again and pray as I have before for a bright future.